Who wouldn’t know the benefits of goats milk – so why destroying it by adding it to soap? The question can be asked also from the other point of view: why not to enhance soap by adding some goat milk? A lot of people love goat milk soap, claiming that it is the best for problematic and sensitive skin. I have no personal experience (since my skin has no problems), so I cannot confirm, but it seems it is very pleasant to use! Goat milk can be made using any basic soap recipe just substituting water for milk. This is why we try to keep the temperature of the lye solution as low as possible and therefore we freeze the milk before dissolving lye in it. all the additives, including essential oils and fragrances! So I decided to make an experiment and make goat milk soap from a mix of oils that together don’t give by default very white soap and tried to find out, how gel phase as well as added essential oil influence the colour. Since I knew that with cocoa butter and cinnamon oil I won’t be expecting very white soap, I also opted for adding a well known whitener: zinc oxide (ZnO) to the part of the soap. Another option is to add Ti2O (titanium dioxide). The recipe I tried is a bit unusual (and I do not recommend it for beginners) – I used stearic acid to make the bar harder (simply because I had not much butters). 1. I melted stearic acid and cocoa butter in rice bran oil and olive oil. Note that at the temperature below 50°C stearic acid will start to solidify again. That means the soap must be mixed at 50°C – this is a relatively high temperature for the milk soap, but I tried it. 2. I slowly dissolved NaOH in the milk – to keep the color as white as possible, try to keep the temperature as low as possible – this might mean to add the milk ice cubes during the process. I did not freeze all the milk, since it is very difficult and slow to dissolve lye in the milk ice cubes only. It is also good to keep the pitcher with lye in ice water. Be sure that you dissolved all the NaOH before pouring it into the oils! 3. Then I poured lye in the oils and stirred well by hand. It thickened very quickly due to the oils (stearic acid and cocoa butter) cooling down. Also, stearic acid reacts very quickly with lye. It is important not to cease stirring – after while, the soap will thin again. 4. I added ZnO into half of the soap and blended it in with a mixer, which caused the soap to trace very fast until separation occurred – I expected this, since this soap traced already very fast hand stirring, however, blending is the only way to distribute ZnO in soap evenly. Normally, that is the reason why I would have dissolved ZnO in the milk first. this way I could be sure the soaps won’t gel (also because it is colder, in the summer, they might have gelled in individual moulds, too). 6. 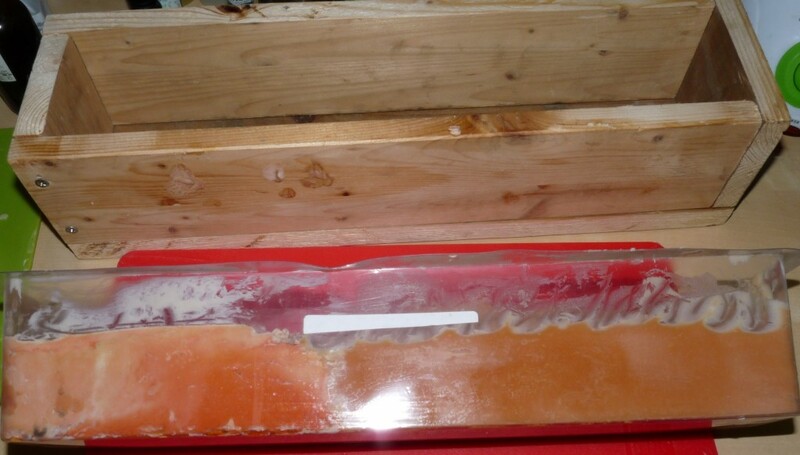 Then, I hand stirred the EO blend to the rest of the soap (both with ZnO and without ZnO) and spooned it into my big log mould (see image below). 7. 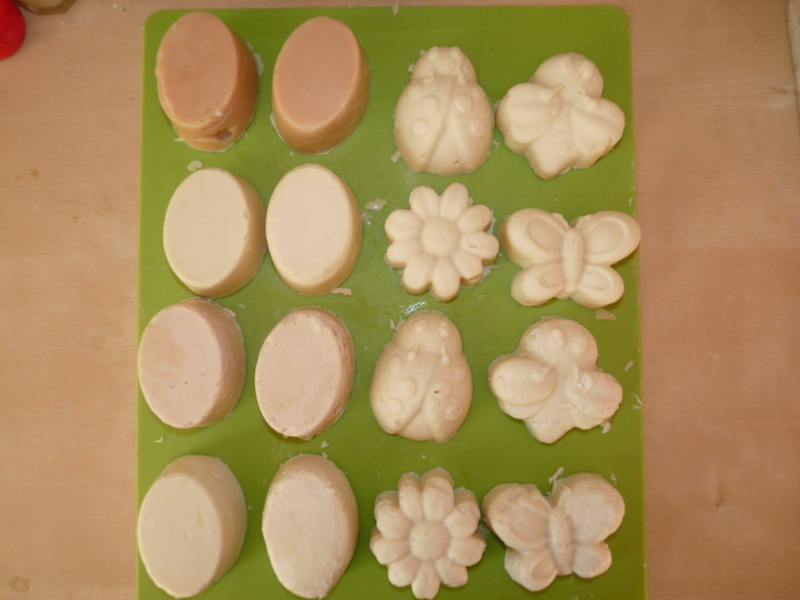 12 hours later, I unmoulded the soaps – the non-gelled unscented ZnO soaps were too soft, so I had to freeze them prior to unmolding. 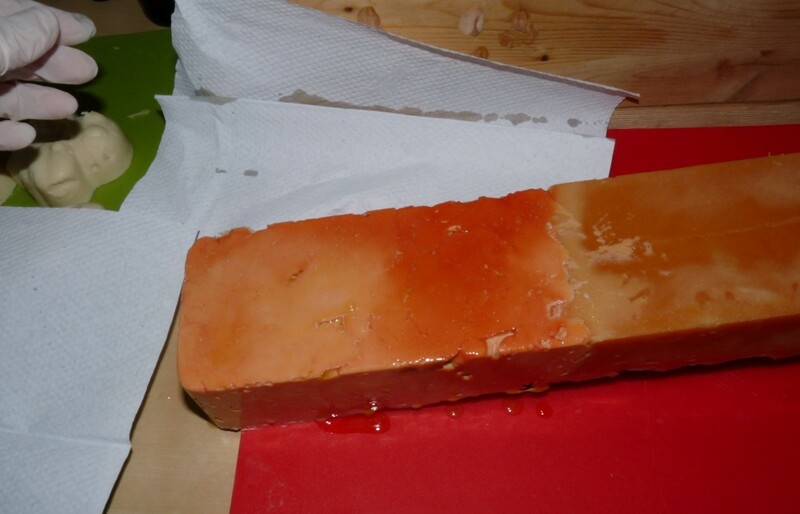 Log mould – soap gelled. Left part is with ZnO, right par without ZnO. The left part was partly separated when I spooned it into mould and due to the gel phase, part of essential oils together with some water and glycerine were pushed out of the soap – on the top as orange drops. The right part gelled evenly without separation. Note the pink colour – this is the effect of cinnamon essential oil. The left part is whiter thanks to ZnO. The separated liquid is not a problem and does not harm soap – simply gently remove it using a wipe. 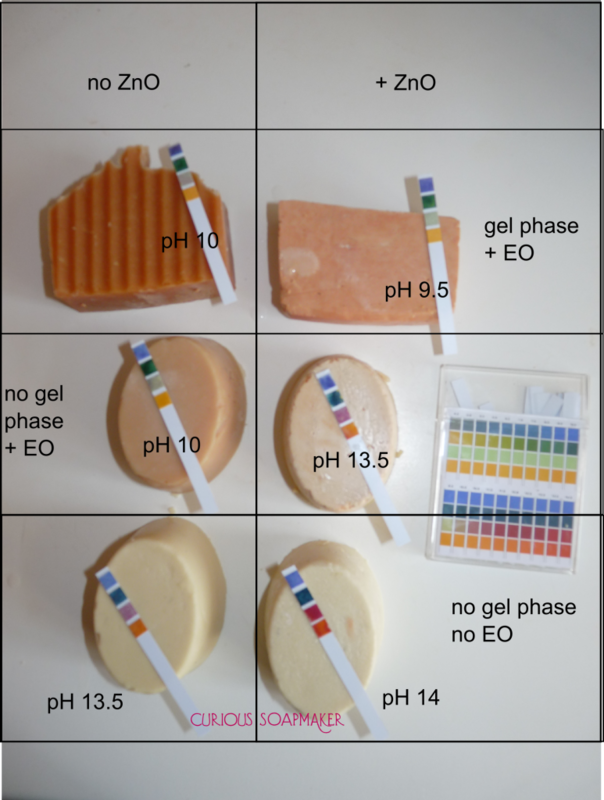 The image below shows the difference in goat milk soap colour based on its ZnO and EO content and if it passed gel phase or not. I also added pH test! … or if your oils do not give very white soap, or you wish it really very very white, you can add zinc oxide – ZnO or titanium oxide – Ti2O (app. 30g-60g per 1kg of oils) – however, beware that if your soap is too thick at trace, your soap will after blending in the ZnO separate. You better dissolve it in milk prior to adding lye. 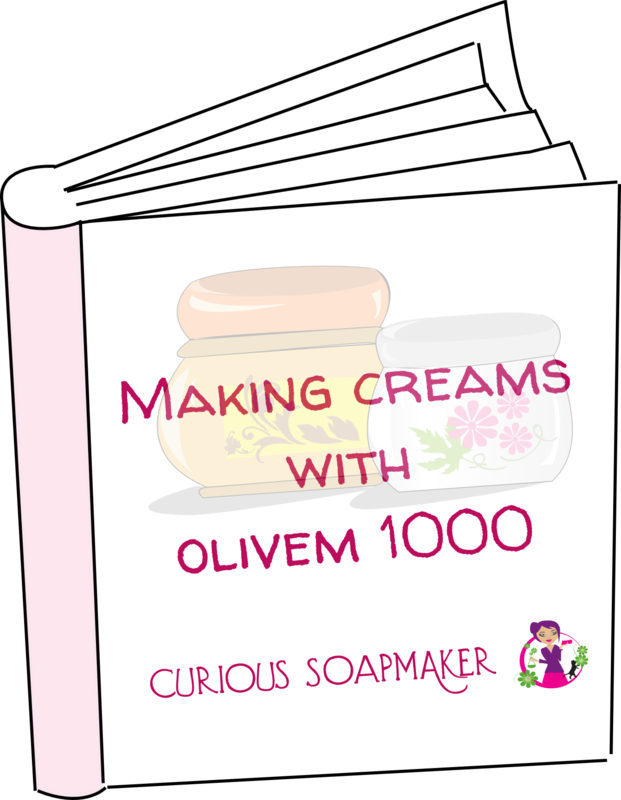 … and do not forget you can turn almost any soap recipe into milk soap, however, bear in mind what I wrote above! Lemon yogurt soap for fresh morning – using yogurt – one of the best recipes! 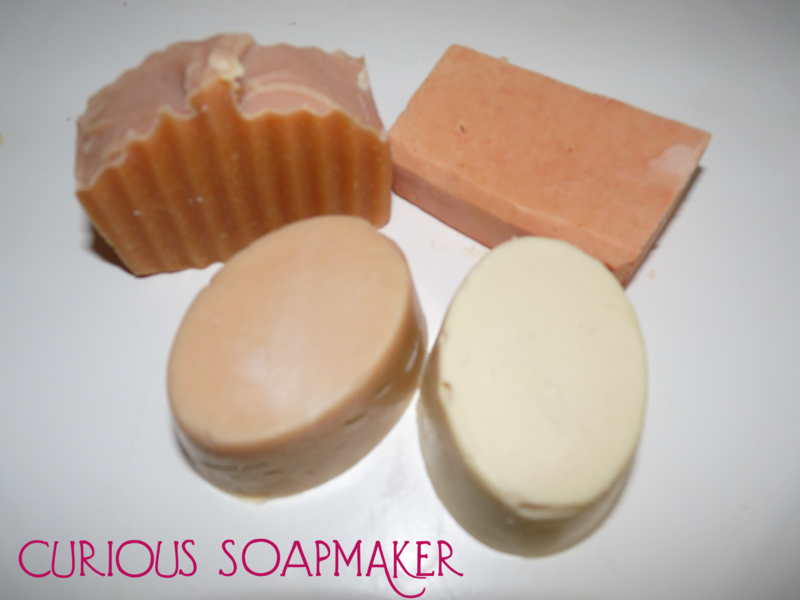 This entry was posted by evik on September 29, 2014 at 20:31, and is filed under milk soap, soap color, soap recipes, soapmaking. Follow any responses to this post through RSS 2.0.You can leave a response or trackback from your own site. Hi Ann, ZnO is Zinc oxide. I should have mentioned that…. correcting the article! We are able to get powdered goats milk here which I will use sometimes & do a “milk in oil” method. You can also do the same with cold milk in the oil directly then add the lye to this. I Have the lye at @ 75 F (room temp) I just mix it the night before. No whitener needed. Soap comes out very cream coloured! Goat’s milk soap has such a great lather. 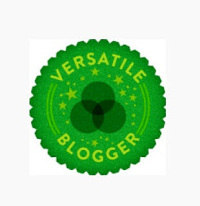 Makes wonderful gifts =) I love your super informative article. I really like a light tan color in milk soap. I never really thought of trying to make it white. We keep the container that holds the milk in an ice bath while mixing, and keep a close watch on the temperature as the lye is added to the milk. It seems, as you suggest, that keeping the temperature of the milk relatively low is key to good results. And, as pointed out, the temperature of the milk can really climb in a hurry if the lye is added fast. Instead of replacing all the water with milk, I split the water amount with half milk and freeze into ice cubes or simply chill the milk. I never use a stick blender with milk soaps…just whisk in order to give me more time to color a cup or two of soap batter. Sometimes a quick burst of the stick blender when adding TD to whiten the batter. Whether I use goat, coconut or whipped cream I prefer adding the milk after the full strength lye water has been added to the oils. I Mix together when Lye water is 85 degrees and oils 125 Degrees and after lye has chomped on the oils a bit I then add the frozen or cold liquid milk.i add the milk as if I was Superfatting. Wooden mold. Then into the fridge to prevent gel…..creamy white color. Hi, thank for sharing this recipe and your amazing website! Is it possible to use Aluminum Sulfate instead of NaOH?? Hi Donya, well, I frankly admit that I don’t know. I know soaps can be made with different bases, but don’t remember reading about aluminium sulfate.